Games allowed: Legend of the Nile, The Angler, Rook’s Revenge slots, bingo, slots. 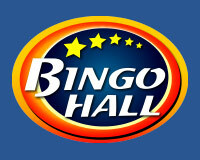 Games allowed: Bingo games in the Dollar Room, Desperate Housewives, Fusion and Supernova. Games allowed: Bingo games in Dollar Room, Game of Thrones room, Nickels room, Bingo cafe,. This month Gilda is offering lots of love and lots of BBs, join BingoHall in the popular bingo rooms for the Kiss of Gilda promotion and you can triple your BBs! Games allowed: A Christmas Carol, True Illusions, Greedy Goblins slots, Bingo. Wager on selected slot games and on bingo games. For each $1 wagered you get 1 point, prizes range from $300 to $2400 cash for first position. A deposit of cumulated $75 is required in order to participate, have fun! Games allowed: Reels of Wealth, Sugar Pop Double Dipped, Mega Gems, Bingo games. Games allowed: Slots, bingo games. Games allowed: Bingo games in the Supernova room. Bingo Hall invites you to their April Fools Luck promo this week, you can win a $500 Amazon voucher card. Find the April Fools pattern in the bingo rooms and make a deposit of $35 in order to qualify, enjoy!